A nine-year-old boy was taken from his bed and forced to perform boot camp-style exercises by his parents and step parents for three hours. 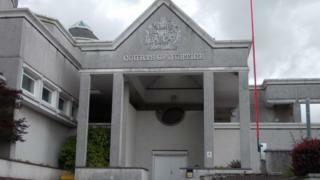 The boy, from the St Austell area of Cornwall, was kept up until the early hours, Truro Crown Court heard. He had been made to do push-ups, sit-ups, and other exercises. His mother and stepfather admitted child cruelty and were given suspended jail terms. His father and stepmother were cautioned by the police. Prosecutor Adrian Chaplin said the boy was initially sent to bed at his mother's house at 17:30 GMT on the last day of the Christmas holidays. Mr Chaplin said the stepmother arrived and the boy was got out of bed at 21:30. His father arrived later. The boy was give set times to complete "boot camp-style" exercises and if he failed he had to start again, Mr Chaplin said. The boy was crying, but was only allowed to go to bed at 01:05, he said. It came to light when the boy told staff at his school the following day. Mr Chaplin said: "At no stage did any of the adults step back and ask themselves 'What on earth are we doing?'." Sentencing the mother and stepfather to six months in prison, suspended for 18 months, Judge Simon Carr said they had decided to punish the boy in front of all four adults. "You took him from bed and over a period of three to three and a half hours (made him) perform push-up and sit-ups, exercises more suitable for a military camp," he said. Mary McCarthy, defending the stepfather, said he had been "underequipped" to deal with parenting. Jason Beal, for the mother, said she had been at the end of her tether, but her actions were "grossly inappropriate".